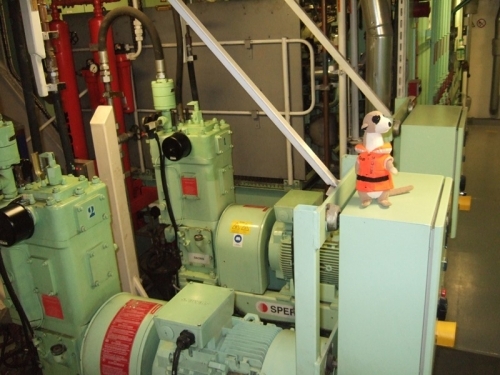 today I continue my tour through the engine room! I found a lot of other interesting equipment there, but I have to share about a special event which took place this week as well! 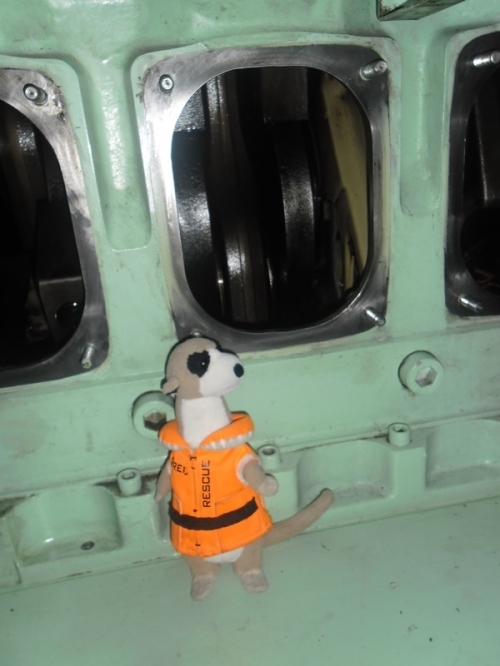 Here I sit on the lub oil automatic filter of the main engine. Big - or not? 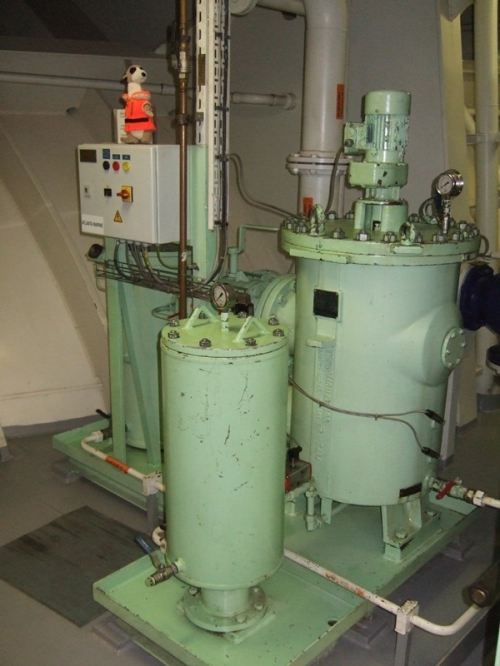 15000 liter lubricating oil is necessary to operate the main engine on board Gaschem Adriatic. The oil, Christoph told me, is hardly used up. So, if the crew takes care of it it might stay for years in the engine and is only topped up from time to time. Have you ever thought of this: How starts such a huge engine to turn around? You cannot just go there and turn it over with a crank handle! That’s why there are starting air compressors on board. They produce compressed air. This air is then stored in huge bottles and with it the engine is started (30bars pressure) until through ignition the engine continues to turn by itself. Hey, can’t you smell it? Honestly, me neither! Actually I am standing right beside the sewage plant. Very interesting! Yes, also seamen and –women have to use from time to time the toilet! And where does the … go? Right, in the on board sewage plant! All on board used water goes there – from toilets, showers, sinks, the galley, laundry etc., is treated and then pumped overboard. As you see, a ship is like a small village. Everything is there what you find ashore, just a few “sizes” smaller on board. Puh, it is very hot. Be happy that you don’t sit here. It is the hottest corner in the engine room. All pipes are insulated but it is still uncomfortable to stay for a longer time there. Why? The heavy fuel oil is heated up to 130°C in this corner. Only at this temperature heavy fuel oil has properties like gas oil or diesel. By the way, at 20°C heavy fuel oil is very sticky! How and with what heavy fuel oil is heated I tell you in a later report. So, better to move on before I get a heat stroke! I worked as well! 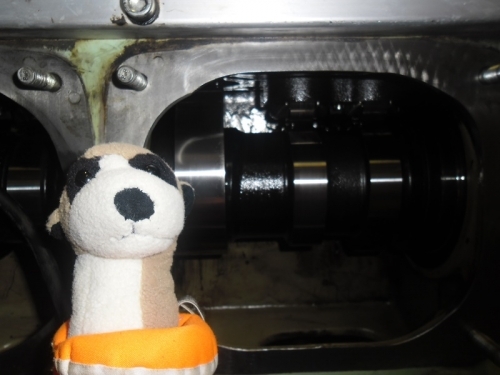 On both pictures you can see me in front of the camshaft and crankshaft of an auxiliary engine. 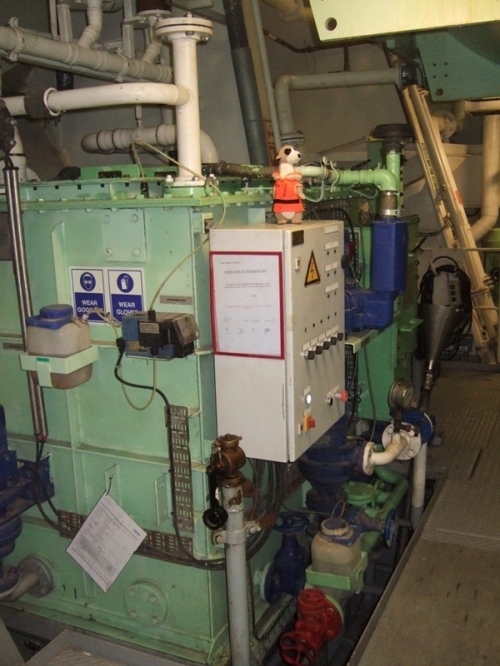 An auxiliary engine drives a generator which produces electricity for the ship. 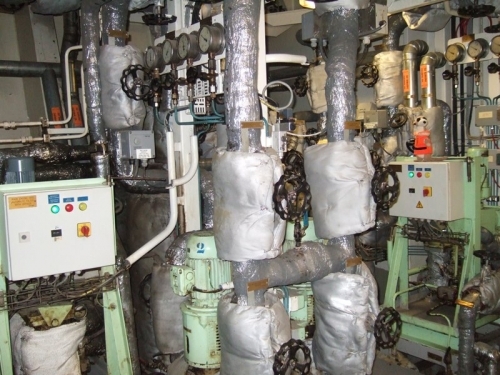 On board Gaschem Adriatic are three auxiliary engines installed. The attached generators can produce 975kW electrical power each. Christoph and the crew carried out an inspection of the crank- and camshaft and changed the lubricating oil! This is Jose from the Philippines. 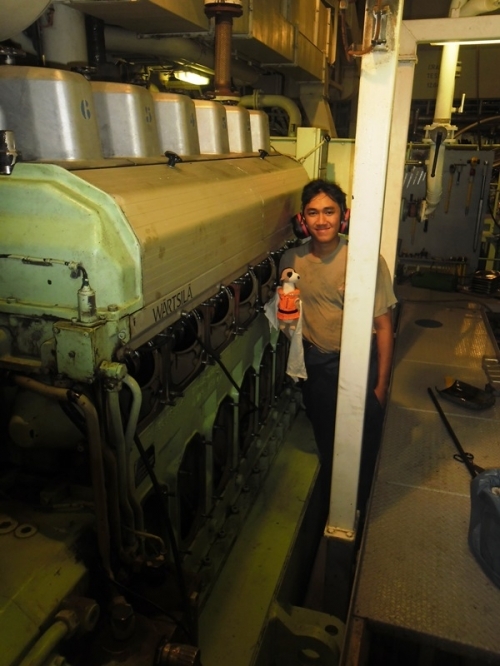 He works as engine cadet on board. He helped Christoph and the 3rd engineer with the work on the auxiliary engine. Now they just have to put back the covers and the engine is again ready to use again for 1000 hours before the next oil change! This week Christoph celebrated his 30th birthday. 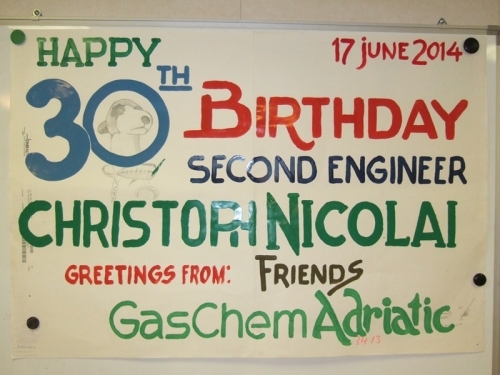 I was one of the first who wished him all the best and the bosun made a beautiful poster for this special day! I am on it, too! You found me already? Cool! During the party in the evening we had a great time together. 30 you only get once in your life!